Christian Cameron has written a lot of novels. A lot. He writes novels faster than some people can read them. He writes so many novels that it’s easier to count the series of novels he has written than the number of novels he has written. His are novels of historical action and adventure. Yet, unlike many novels of that sort, Cameron takes a great deal of care to create mentalities and dialogue that are of the eras in which he writes. And, beneath the action, are a number of ideas that Cameron is working out–as well as a wide variety of life experiences. Today he and I discuss some of those experiences, and his penchant for “experimental archaeology” and “historic martial arts,” and how he brings them to bear on his writing. 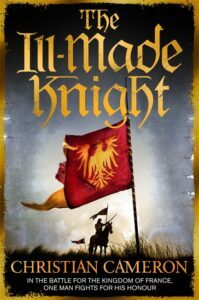 We spend most of our time talking about his latest series, featuring William Gold, an English mercenary in Italy and the Mediterranean during the middle of the 14th century. And in a month or so, Cameron will have published the first novel of yet another series. It’s hard to believe that he does anything but write. But he does. He really does.